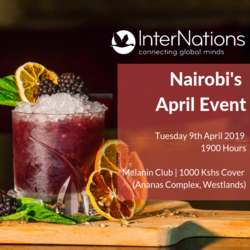 InterNations Nairobi April Event @ A Brand New Location! What a month that was! Thank you all very much for making our March events epic! April is upon us and we cannot wait to see you all again. Join us for our first event at one of Westlands' latest spots, Melanin Club (located inside Ananas Complex in Westlands) simply because we love exploring new spaces in your company. You know the drill, grab your cards for the business card draw and bring your amazing selves to Melanin club!